If the first book I finish in a given new year is any indication, 2011 is going to be good, literature-wise, thanks to Alain de Botton's The Architecture of Happiness. 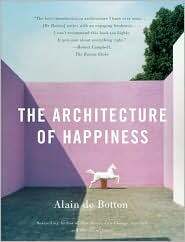 In restrained and elegant prose, de Botton thoughtfully considers what makes a building appealing to the human spirit. His focus ranges widely, but is carefully tailored to create a well-molded, artfully structured treatise ? why are so few architectural styles enduringly appreciated? To what extent should buildings be influenced by their surroundings? What design principles affect us, how do they do so, and why? The Architecture of Happiness is more than a list of what we find pretty and what we don't. In a cool and detached manner, de Botton examines the sometimes turbulent marriage of form and function, the messy attachment of connotations given to certain styles and the elusive nature of that which, in his field, is most difficult to define ? true beauty made lasting in the form of some structure. de Botton's mind is clearly first-rate, but this shows itself in its powers of acute observation, storytelling power and ability to present challenging ideas cleanly and simply rather than in show-offy cerebral gymnastics. His words are beautiful in their tight, sharp execution; there isn't a cumbersome or lagging sentence in the book.